Ah youth! The time of living life in wild abandon. High school years are the time of gaining more independence, learning to drive, and staying out later. After graduation and into college, you get your first taste of adulthood - going to parties, drinking, experimenting, and yes, eventually earning a degree and entering the real world. Now you're applying for a job and the employer wants to run your background check. You may not be as wild as your younger days but some youth mistakes could still show up on a background check. Here's what an employer will see. Even as adults, we occasionally over-imbibe. A typical college student, however, may not realize that the room spinning isn't a fun feature - it means you're about to make a run to the bathroom or pass out. Unfortunately, this still doesn't stop some people from endangering themselves or others by getting behind the wheel. A first offense DUI (or DWI, OUI, OWI) may not lead to jail time but, depending on the state, it could stay on your record for five, seven, or ten years. Hormones be damned! When passionate teenagers feel exceptionally slighted or inebriated, fights may occur. Being sent back to the dorm with a black eye is one thing but if the cops were called, you could have a record for disorderly conduct. Disorderly conduct charges could be considered as a misdemeanor or a felony. The circumstances and the jurisdiction determine how it shows up on your criminal record. Domestic violence or brandishing a weapon, as an example, may be a more serious offense than getting into fisticuffs during a bar brawl. Once you decided to move out of your parents' house, you also decided to try everything that was forbidden. Remember, even if marijuana is legal in your state, an employer can still deny you a job if you tested positive during a drug screening. Being found with illegal drugs or even alcohol, whether you're under the influence or not, could result in "minor in possession" charges. In California, a first offense means you could lose your driver's license for a year but every state handles these charges differently. Woe is the broke college student who lives on Ramen. Every now and then, a good juicy steak would hit the spot, right? Being a full time student meant you couldn't afford the steak so you slipped it under your jacket and tried to leave the store. Security cameras are everywhere now. Cue the sad trumpet. If you're under the age of 18, in some states, your case could have been handled in the juvenile court system. Again, depending on the state, the value of the items, and your age, the shoplifting charge may be considered petty theft or a felony. Learning to drive is a challenge faced by most teenagers. Learning to drive well is a challenge faced by most adults as well. If your career choice involves driving at all, any moving violations or traffic tickets could show up on your background check. Parking tickets, unpaid tolls, accidents, and speeding tickets can all add up, especially if they go unpaid. It may seem harmless at the time to pocket some cash while you're at work but it can damage your chances at getting another job. Workplace theft can range from minor infractions to a full theft ring causing serious damage to the business. Being caught stealing from work could go on a criminal record as well as your employment record. In other words, you're not likely to get a good reference for your next job. How Far Back Can Employers Look? Most everyone makes stupid mistakes in their youth that come back to haunt them later. The good news is that Ban the Box and other Fair Chance Laws across the nation are regulating employers to do a criminal background check only after a job has been offered. With the EEOC recommending each criminal record that shows up 7 to 10 years later be individually assessed, you're still likely to have a chance at the job if you've improved your behavior. Good luck! 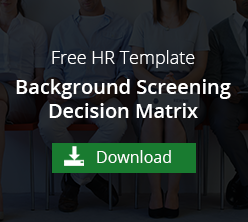 Need a Background Check Policy for Your Company?